An exhilarating new attraction will be opening in the UK on the 6th of September in Bedfordshire. Bodyflight, the World’s largest indoor skydiving wind tunnel, is opening a new thrill ride: Bodyflight Vertigo. A State of the art Fan descender will be opening on the roof of the famous grey tower; allowing thrill seekers to leap from the top and plunge to the ground in complete safety. 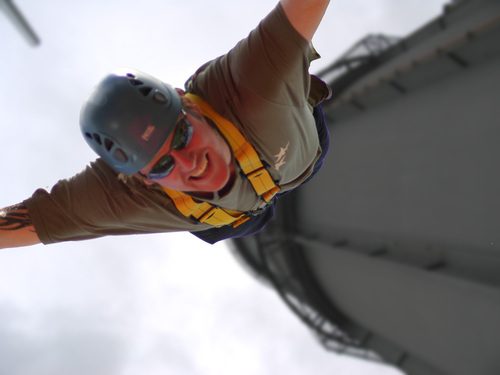 At a massive 120ft the jump is one of the tallest in the UK and has already attracted interest from thrill seekers and extreme sports enthusiasts from across Europe. The launch party for the experience will take place on the 6th of September from 2pm onwards. Media interest has already been sparked in Bodyflight due to the release of the new Bond movie: Quantum of Solace. Scenes for which were filmed at Bodyflight in February. Vertigo is completely safe: customers wear a full body harness which has a cable attached to the back. Once they step off the platform they freefall for the first two thirds of the drop before the cable slows them down, allowing them to gently land on their feet at the bottom. Jumps start from just £30. Gift vouchers are available as are combined visits with the wind tunnel and fan descender for the ultimate Bodyflight experience! This press release was distributed by ResponseSource Press Release Wire on behalf of Bodyflight Ltd in the following categories: Men's Interest, Entertainment & Arts, Leisure & Hobbies, Sport, for more information visit https://pressreleasewire.responsesource.com/about.